Emperor Wen of Wei redirects here. For the emperor of Western Wei (Yuan Baoju), see Emperor Wen of Western Wei. Cao Pi (Ts'ao P'ei.曹丕, 187-June 29, 226), formally Emperor Wen of (Cao) Wei (曹魏文帝), courtesy name Zihuan (Tzu-heng子桓), posthumous name (shih) Wen-ti, was the second son of the Chinese politician and poet Cao Cao (Ts'ao Ts'ao ) and was the first emperor and the real founder of the short-lived Cao Wei (曹魏, also known as "Kingdom of Wei," 220–265/266 C.E. ), one of the Three Kingdoms. Cao Pi (Ts'ao P'ei) succeeded his father as king of Wei in 220, and formally proclaimed the end of the Han dynasty. He forced Emperor Xian( 漢獻帝) to abdicate the throne and proclaimed himself emperor of Wei. Cao Pi continued his father's war against Liu Bei ( 劉備) Shu Han ( 蜀漢) and Sun Quan (孫權) Eastern Wu ( 東吳) but was unsuccessful. Unlike Cao Cao, he concentrated most of his efforts on his home country, which prospered under his rule. Cao Pi (Ts'ao P'ei)'s Wei dynasty never controlled more than the northern part of China and lasted less than fifty years. Cao Pi, like his father, was a poet. The first Chinese poem using seven syllables per line (七言詩) was the poem 燕歌行 by Cao Pi. He also wrote over a hundred articles on various subjects. Cao Pi was born in 187, in Qiao County, Pei Commandery (modern Bozhou, Anhui), the eldest son of Cao Cao and one of his favorite concubines, Lady Bian. At the time of Cao Pi's birth, Cao Cao was a mid-level officer in the imperial guards in the capital Luoyang (洛陽), with no hint that he would go on to the great campaigns that he would eventually carry out after the collapse of the imperial government in 190. After 190, when Cao Cao was constantly waging war, it is not known where Cao Pi and his mother Lady Bian were, or what their activities were. Of all his brothers, Cao Pi was the most shrewd. Instead of pursuing studies or conducting military affairs, he was always in the presence of court officials in order to win their support. At the beginning of his career, he was put in charge of defense. After the defeat of Yuan Shao (袁紹) at Guandu, he took the widow of Yuan Shao's son Yuan Xi, Zhen Luo (甄宓;甄洛), formally Empress Wenzhao (文昭皇后), as a consort. The lone historical reference to Cao Pi during this period was the record of their marriage in 204. Lady Zhen gave birth to Cao Pi's oldest son Cao Rui ( 曹叡) only eight months later, which created rumors that Cao Rui might have been biologically Yuan Xi's son and not Cao Pi's, although the possibility appeared farfetched. The next historical reference to Cao Pi's activities was in 211, when he was commissioned to be the commander of the imperial guards and Deputy Prime Minister (assistant to his father, who was then Prime Minister and in effective control of the imperial government). His older brother Cao Ang had died earlier, and Cao Pi was now the oldest son of Cao Cao. His mother, Lady Bian, had become Cao Cao's wife (after Cao Ang's adoptive mother, Cao Cao's first wife Lady Ding, was deposed), making Cao Pi the presumptive heir of Cao Cao. That status, however, was not immediately made legal, and for years there were lingering doubts about whom Cao Cao intended to make heir. Cao Cao greatly favored a younger son, also by Lady Bian, Cao Zhi, who was known for his literary talents; while Cao Pi was a talented poet, Cao Zhi was even more highly regarded as a poet and speaker. By 215, the brothers were to all public appearances in harmony, but behind the scenes each had his own group of associates, vying for power. Initially, Cao Zhi's party appeared to be prevailing, andin 216 they succeeded in falsely accusing two officials, Cui Yan and Mao Jie, who supported Cao Pi. Cui was executed, and Mao was deposed. However, the situation changed after Cao Cao received advice from his strategist Jia Xu, who concluded that changing the general rules of succession (primogeniture) would be disruptive, using Yuan Shao and Liu Biao as counterexamples. Cao Pi was also cultivating his public image and creating the impression that Cao Zhi was wasteful and lacking actual talent for governance. In 217, Cao Cao, who was by this point Prince of Wei, finally declared Cao Pi as Crown Prince. He remained in this position until his father's death in 220. Cao Cao died in the spring of 220, while he was at Luoyang( 洛陽). Even though Cao Pi had been Crown Prince for several years, there was initially some confusion as to what would happen next. The apprehension was particularly heightened when, after Cao Cao's death, the Qing Province (青州, modern central and eastern Shandong) troops suddenly deserted, leaving Luoyang and returning home. Cao Zhang, who had favorably impressed the troops, quickly went to Luoyang, creating apprehension that he was intending to seize power from his brother. Cao Pi, hearing this news at Cao Cao's headquarters at Yecheng, quickly declared himself the new Prince of Wei and issued an edict in the name of his mother, Princess Bian, to that effect—without confirmation from Emperor Xian of Han, of whom he was still technically a subject. After Cao Pi's self-declaration, neither Cao Zhang nor any other individual dared to act against him. One of the first acts that Cao Pi carried out as Prince of Wei was to send his brothers, including Cao Zhang and Cao Zhi, back to their marches (frontier borderlands). Cao Pi, particularly fearful and resentful of Cao Zhi, soon had his march reduced in size and killed a number of his associates, including Ding Yi, who was chief among Cao Zhi's strategists. In the winter of 220, Cao Pi finally made his move for the imperial throne, strongly suggesting to Emperor Xian that he should yield the throne. Emperor Xian did so, and Cao Pi formally declined three times (a model that would be followed by future usurpers in Chinese history), and then finally accepted, ending Han Dynasty and starting a new Wei Dynasty. The former Emperor Xian was created the Duke of Shanyang, aand Cao Pi married his two daughters. Cao Pi posthumously honored his grandfather Cao Song and father Cao Cao as Emperors, and his mother Princess Dowager Bian as Empress Dowager. He also moved his capital from Xu (許縣, in modern Xuchang, Henan) to Luoyang. A 7th century Tang Dynasty era painting of Cao Pi and ministers at his side, by Yan Liben (600-673). After news of Cao Pi's ascension (and an accompanying false rumor that Cao had executed Emperor Xian) arrived in Liu Bei's domain of Yi Province (益州, modern Sichuan ( 四川) and Chongqing ( 重慶)), Liu Bei declared himself Emperor as well, establishing Shu Han (蜀漢). 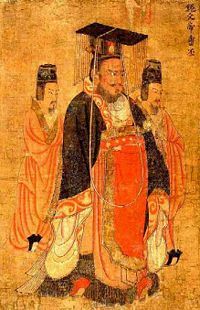 Sun Quan, who controlled the vast majority of modern southeastern and southern China, did not take any affirmative steps one way or another, leaving his options open. An armed conflict between Liu and Sun quickly developed, because in 219 Sun had ambushed Liu's general and beloved friend Guan Yu to reclaim western Jing Province (荊州, modern Hubei and Hunan), which Liu had controlled, and Liu wanted to exact vengeance. To avoid having to fight on two fronts, Sun formally paid allegiance to Cao, offering to become a vassal of Cao Wei. Cao's strategist Liu Ye (劉曄) suggested that Cao decline and attack Sun on a second front, effectively partitioning Sun's domain with Shu Han, and then eventually seek to destroy Shu Han as well. Cao declined, in a fateful choice that most historians believe restricted his empire to ruling only northern and central China. An similar opportunity never arose again. Against Liu Ye's advice, Cao Pi created Sun the Prince of Wu and granted him the nine bestowments (Chinese: 九錫; pinyin: jǐu xí; literally "nine tin", awards given by Chinese emperors to extraordinary officials, ostensibly to reward them for their accomplishments.). Sun's submission did not last long, however. After Sun's forces, under the command of Lu Xun, defeated Liu Bei's forces in 222, Sun began to distance himself from Cao Wei. When Cao demanded that Sun send his heir Sun Deng (孫登) to Luoyang as a political hostage and Sun refused, formal relations broke down. Cao personally led an expedition against Sun, and Sun, in response, declared independence from Cao Wei, establishing Eastern Wu. By this time, having defeated Liu, Eastern Wu's forces enjoyed high morale and effective leadership from Sun, Lu, and a number of other capable generals, and Cao's forces were not able to make significant advances against them, despite several large-scale attacks during the next few years. The division of the Han empire into three states had become firmly established, particularly after Liu Bei's death in 223. Liu Bei’s prime minister Zhuge Liang, serving as regent for his son Liu Shan, re-established the alliance with Sun, causing Cao Wei to have to defend itself on two fronts, unable to conquer either. Exasperated, Cao made a famous comment in 225 that "Heaven created the Yangtze to divide the north and the south." Cao Pi was generally viewed as a competent, but unspectacular, administrator of his empire. He commissioned a number of capable officials to be in charge of various affairs of the empire, employing his father's general guidelines of valuing ability over inherited status. However, he was not open to criticism, and officials who dared to criticize him were often demoted and, on rare occasions, put to death. There were many internal conflicts during Cao Pi's rule. He demoted his brother Cao Zhi ( 曹植) (who had contended with him for the position of Cao Cao's heir) and had two of Cao Zhi's best friends executed. According to legend, his younger brother Cao Xiong committed suicide out of fear of his brother, although this was undocumented in actual historical records. Cao Pi also put Yu Jin to shame for his loss to Guan Yu, causing him to become ill and die. He further restricted the roles of his other brothers in the imperial administration; unlike princes of the Han Dynasty, under regulations established by Cao Pi, Cao Wei princes had minimal authority even in their own principalities and were restricted in many ways. Many historians attribute these heavy restrictions to Cao Pi’s jealousy of Cao Zhi's literary talent and Cao Zhang( 曹彰)'s military might. An immediate issue after Cao Pi became Emperor in 220 was the selection of his Empress. Lady Zhen was his wife, but had lost favor long before due to a variety of reasons, including the struggle she had with a favorite concubine of Cao's, Guo Nüwang. Lady Guo used the unlikely possibility that Zhen's son Cao Rui might be biologically Yuan Xi's son, to full advantage in creating conflicts between Cao Pi and Lady Zhen. Cao therefore refused to summon Lady Zhen to Luoyang after he ascended the throne, but instead ordered her to remain at Yecheng, which caused Lady Zhen to become resentful. When words of her resentment reached Cao, he became angry and forced her to commit suicide. In 222, Cao created Consort Guo empress. 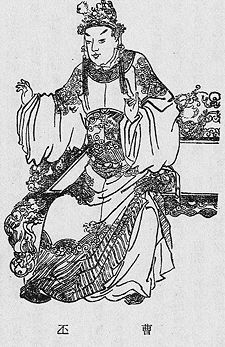 Empress Guo, however, had no sons. Lady Zhen's son Cao Rui was the oldest of Cao Pi's sons, but because she had been put to death and because of the lingering doubt as to Cao Pi's paternity, he was not created Crown Prince, but only the Prince of Pingyuan, after Cao Pi's ascension. Cao Pi, however, did not appear to have seriously considered any other son as heir. (This might have been because the other sons were all significantly younger, although their ages were not recorded in history.) In the summer of 226, when Cao Pi was seriously ill, he finally created Prince Rui crown prince. He died soon afterward, and Prince Rui ascended the throne. Cao Pi, like his father, was a poet. The first Chinese poem using seven syllables per line (七言詩) was the poem 燕歌行 by Cao Pi. He also wrote over a hundred articles on various subjects. ↑ Sinica.edu.tw. Retrieved December 18, 2007. All links retrieved January 9, 2017. This page was last modified on 9 January 2017, at 16:39.